The Key Manager lets you create, install, and disable keys for TouchDesigner. When TouchDesigner does not find a valid key on startup, the Key Manager dialog will automatically open. When already running TouchDesigner, the Key Manager can be opened from the Dialogs menu or using the <alt+k> shortcut. This section describes creating and installing a key for TouchDesigner if your computer is connected to the internet. If you do not have an internet connection on the computer, see the Offline section below. Select the Create option along the top of the Key Manager Dialog. Sign In using your Derivative username and password. Click the Sign In button. In the following dialog, it will display all the available licenses in your account. 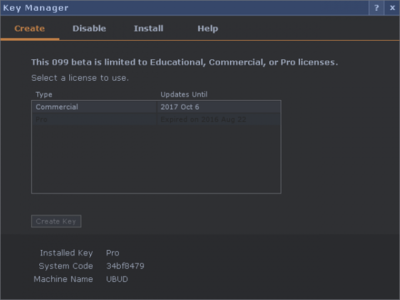 Select which license to create a key with and click the Create Key button. Licenses that are greyed out need to be updated to work with the installed build. The key will be created and installed and you're ready to go!. This section describes creating and installing a key if the computer can not be connected to the internet. In the case that the TouchDesigner computer can not connect to the internet, keys can be created for it on another connected device. 1. Take note of the Machine Name and the System Code near the bottom of the Key Manager dialog on the computer you need to make a key for. 2. 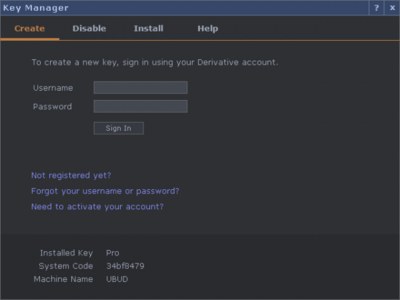 Go to www.derivative.ca and login using your Derivative username and password. Go to the [KEYS] tab. 3. Locate the license you would like to use to create a new key with. 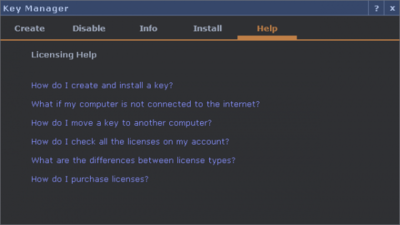 The license must not be in use on another computer (See "Disabling a Key" if the license is in use). 4. Click the Create Key button found on the license. 5. In the popup dialog, enter your computer's information. Click the Create Key button and the key will be created. 6. 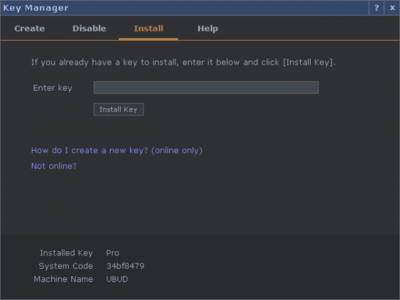 Copy and paste the key into the Install section of the Key Manager Dialog. Click the Install Key button and you're ready to go! The computer must be connected to the internet to disable a key. 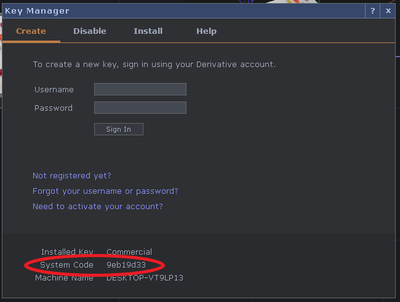 This connection is required so the key can be disabled in your Derivative account which allows you to create a new key for another computer. 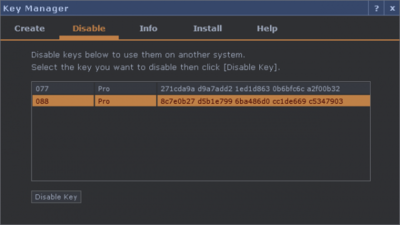 Select the Disable option along the top of the Key Manager Dialog. The list below shows the currently valid keys. Select the key you want to disable by clicking on it. Click the Disable Key button. If the key was successfully disabled in your account (on the Derivative servers) and locally it will be removed from the list and is now ready to use on another computer. The Help section of the dialog has answers to number of frequently asked questions. For any other licensing questions or issues, please contact us at licensing@derivative.ca. The most common reason an existing key stops working is due to the machines system code changing. TouchDesigner license keys are system code specific, and will not work if the code has changed from the original system code that was in use when the key was created. Often system codes change after making core hardware changes (CPU/Motherboard) or operating system changes (such as reformatting or changing versions). System Codes are made using various details from the computer’s hardware and the installed operation system. System Codes are not based on the computer’s network adaptor MAC address. Any of these details changing will results in a completely different system code. Before making such changes to a machine with an active TouchDesigner Key installed, users should disable the existing key using the Key Manager Dialog. If your license key is not working please email licensing@derivative.ca for assistance. This page was last edited on 19 November 2018, at 17:18.